The new publicly funded marine wharf at Montreal will be able to berth the world’s largest container ships after the enlarged Panama Canal opens to transit such ships in April 2015. It has most likely been built “just in case” such a ship should ever arrive at Montreal. On a more certain note, a private company is building a deep-sea port at Middle Melford in the oceanic channel between Cape Breton Island and Nova Scotia, the deep and narrow Strait of Canso that connects the Gulf of St. Lawrence to the Atlantic Ocean. There is great wisdom in building a deep-sea port in the Strait of Canso to accommodate the world’s largest container ships. 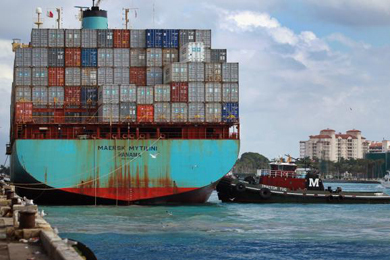 These giant ships provide the most cost competitive method for carrying large numbers of containers over extended distances. The keels of these ships are too deep to sail at full load along the St. Lawrence River between Quebec City and Montreal. By unloading a portion of their cargo at a deep-sea port in Eastern Canada, these ships will rise up to a higher level “just in case” they will sail to Montreal. But while the super ship is sailing through the Panama Canal or is at port in the Strait of Canso, Murphy’s Law may take hold: if something can go wrong, it usually will go wrong. The ship’s captain may receive orders to transfer all containers to local ships and then sail to the Port of Rotterdam where a load of containers bound for overseas will be ready to load. There will still be economic benefit for Canadian customers during such an event, as the largest ships also offer the lowest transportation cost per container. During 2008, the Sea-Point Group compared the cost per container of ocean ships in combination with river barges carrying containers between an Asian port and Memphis (via the Panama Canal) versus the cost of a ship carrying the containers to a West Coast American port with up to ten trains carrying the containers across land to Memphis. Their study revealed that shippers could save up to US$1,000 per container using maritime transportation over the entire journey. That precedent suggests that the combination of giant oceangoing ships and assemblies of river barges could carry containers between Asian ports and Montreal at competitive costs. The laissez-faire free market in international freight transportation could assure competitive transportation costs. The railways may need to assign up to 20 trains to carry the same load of containers over the 1,400-km journey from Halifax to Montreal, or over the 400-km distance from Boston to Montreal. A coupled barge assembly measuring up to one km in length could move the entire load of containers from a super ship, between the Strait of Canso and Montreal at lower cost than ten trains carrying the same load of containers over the shorter distance between Boston and Montreal. "In a laissez-faire market, the “just in case” wharf at Montreal may berth fewer super ships over a given 12-month period than a single wharf at the Port of Toronto over an operating season of 250 days per year." In a laissez-faire market, the “just in case” wharf at Montreal may berth fewer super ships over a given 12-month period than a single wharf at the Port of Toronto over an operating season of 250 days per year. Moving containers by road from a central terminal in Montreal would increase the problem of chronic gridlock on a road system that is literally falling apart. An assembly of barges that arrives at Montreal could instead be split up and sent to multiple smaller wharfs around Montreal and to upstream locations along the St. Lawrence River. Multiple decentralized marine terminals spread out over a wider geographic area would reduce the number of trucks that would otherwise be delayed in gridlock on Montreal area roads, their added weight damaging the roads. Participants in a laissez-faire free market in transportation would develop methods by which to assure the efficient operation of decentralized terminals, from where trucks would move containers over shorter distances to their final destinations. Barge trains could feasibly carry containers between Melford terminal and multiple terminals around and upstream of Montreal, offering customers the possibility of lower transportation costs. But government officials often prefer centralized control to autonomy and support large centralized transportation terminals instead of multiple decentralized terminals that would more efficiently serve the needs of customers. The waterway that connects the Gulf of St. Lawrence to the Great Lakes is subject to government ownership and control. It provides hydroelectric power at four locations, it provides municipalities with drinking water, it is the sewer into which waste products are dumped, it serves the needs of recreational boating and it serves as a transportation corridor. The concept of property rights along the waterway was discontinued decades ago, allowing for the dumping of toxic waste into the waterway with little regard for the residents who live downstream along the waterway. The state-owned and -controlled maritime transportation corridor operates at well below its design capacity and capability. The impending arrival of super ships at East Coast deep-sea ports opens new opportunities to improve the operating efficiency of the inland waterway that connects to the Great Lakes. It is technically possible to develop commercial maritime transportation vessels to sail the inland waterway without polluting the water. It is also technically possible to greatly improve the productivity of commercial ships that sail along the Seaway. The future productivity of the inland waterway would benefit greatly from allowing private initiative to prevail. Ships that sail the world’s oceans have become progressively larger and more productive in their fuel consumption and crew requirements. In contrast, since the inland waterway was built, ship carrying capacity, crew productivity, and fuel consumption have remained unchanged for over 50 years. Such is the hallmark of state ownership and control.